For a long time now, flowers have been associated with femininity. Beautiful inscribed flowers on your body can surely qualify to be one of the cute tattoos. 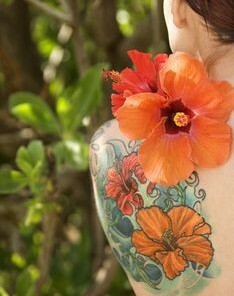 The fact that there is a wide variety of flowers to choose from is big statement that this kind of tattoo is an intriguing one. The most commonly used flowers for tattooing are daisies, lilies, roses, lotus, jasmine, cherry, hibiscus, cherry blossoms, and sunflowers. In most cases, the roses are regarded as a symbol of passion and love, but not so many people are aware that rose tattoos can also symbolize strength. Pink roses normally symbolize adoration and grace, while white roses are used to symbolize eternal innocence and love. In Chinese culture, cherry blossoms symbolize female beauty and love, while in Japanese culture they symbolize the transivity of life. On the other hand, lilies are used to symbolize purity, while lotus is symbols of spirituality in both Chinese and Indian cultures.